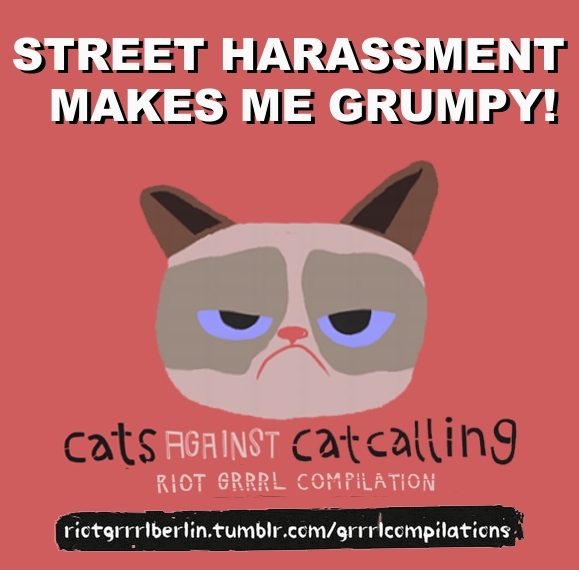 The Streetlamp Doesn't Cast Her Shadow Anymore: Cattitude Adjustment - Riot Grrrl Berlin strikes again! 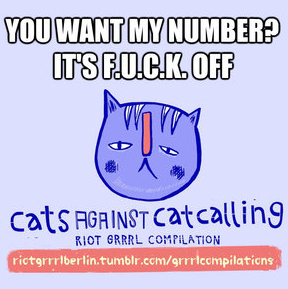 Cattitude Adjustment - Riot Grrrl Berlin strikes again! Yeah, we've not been too busy on the site recently. If you need a reason for this hiatus, I ask you just to have a look at the state of our country and the dicks in our government. Someone has to organise against this mob and that has meant that the Streetlamp blog has taken a back seat to the political activism around these parts. So, there have been a lot of important events distracting us all this last wee while, e.g. the bedroom tax, but we're glad to announce a very important musical release this week that we simply couldn't ignore. So, what is this earth-shattering musical release, I hear you ask? It's only the latest free compilation release from those beautiful, wonderful people at Riot Grrrl Berlin! You will recall that we're huge fans of the Riot Grrrl Berlin ouptput (see 'here' and 'here') and we're pleased to say that this latest release is an absolute humdinger. 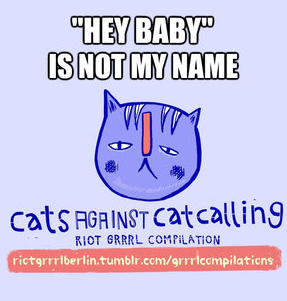 Called 'Cats Against Catcalling! ', the compilation features no less than 95 bands (yep, you read that right - 95!) and contains 5 hours of music ranging from folk to thrash and featuring most things in-between. If you don't find at leat a dozen songs on it that you love then just lie down and pull a sheet over yourself because you are already dead! I'm going to embed a few of my favourite tracks below but, trust me, there are dozens I could have picked from this compilation and I just wish I could include more. Great music, and there's tons more where that came from. 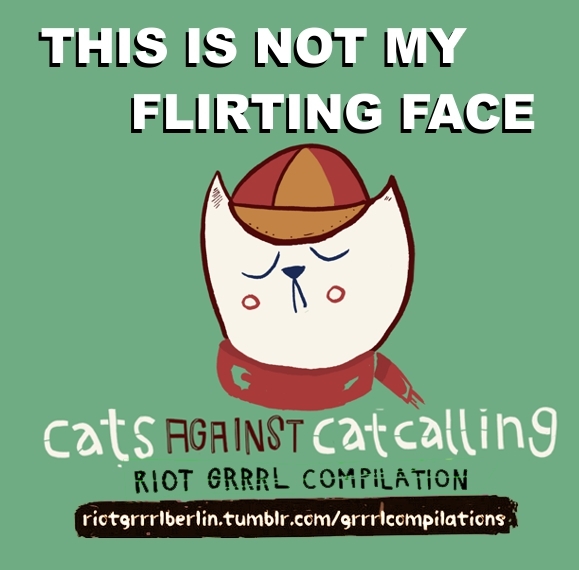 But 'Cats Against Catcalling' isn't just about the music. The inspiration for the compilation came through the Hollaback tumblr page. Hollaback is a movement to end street harassment powered by a network of local activists around the world. Hollaback activists work together to better understand street harassment, to ignite public conversations, and to develop innovative strategies to ensure equal access to public spaces. 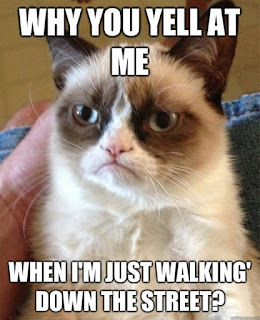 Street harassment is one of the most pervasive forms of gender-based violence and one of the least legislated against. Comments from “You’d look good on me” to groping, flashing and assault are a daily, global reality for women and LGBTQ individuals. But it is rarely reported, and it’s culturally accepted as ‘the price you pay’ for being a woman or for being gay. 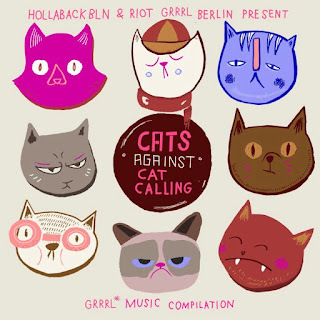 Hollaback and Riot Grrrl Berlin reject this and together they say that "It's time to break the silence about street harassment". To help do this, Riot Grrrl Berlin asked Hollaback Berlin if they would cooperate with the 'Cats Against Catcalling' compilation and give some info and materials to include in the download. Hollaback Berlin have responded magnificently with a downloadable folder packed full of images, posters and documents to print and share. 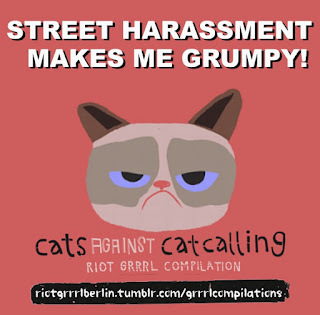 They've also included many cool memes you can use to spread the word against street harassment on the internet. 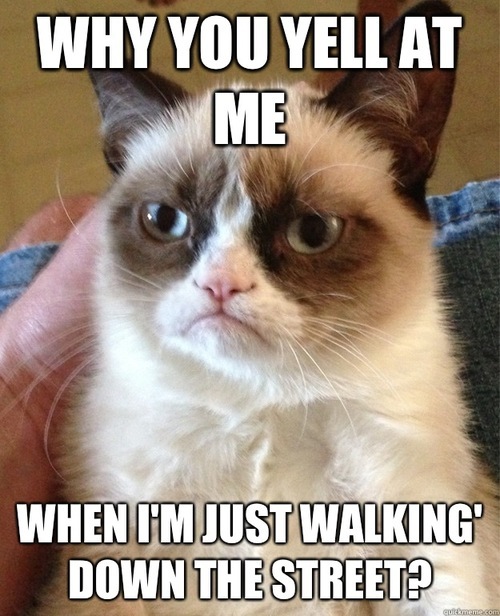 'Cats Against Catcalling' also has its own meme site 'here' where you can add your own images. Why not get creative and share your own designs? It would be really awesome if everyone who downloads this compilation prints some posters, posts some memes and spreads the word. This is what the d.i.y. ethos and direct action is all about. Don't wait for someone else to do something, become the agent of change yourself! 'Cats Against Catcalling' is a brilliant free download full of great music and anti-street harrassment material. 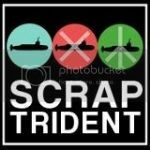 Please, if you download it, share about it on your blog, post it on facebook, print some posters and paste your town.